A couple of weeks ago, we had an exciting delivery of a Degustabox. Degustabox is an exciting monthly subscription service where each month you receive a surprise box of between 10 to 15 food products. Many of these food products will be ones which are new to the market. The box costs £9.99 (plus £3 delivery) each month,with a promise that the value of the products always exceed the cost of the service. You receive your exciting food package between the 25th and 30th of the month and are notified by email or text to ensure your around when your delivery is due. So you may be wondering how this is different to other subscription services, each month Degustabox promise to give you the chance to discover at least 10 new, special or innovative food products from well known brands or new brands. 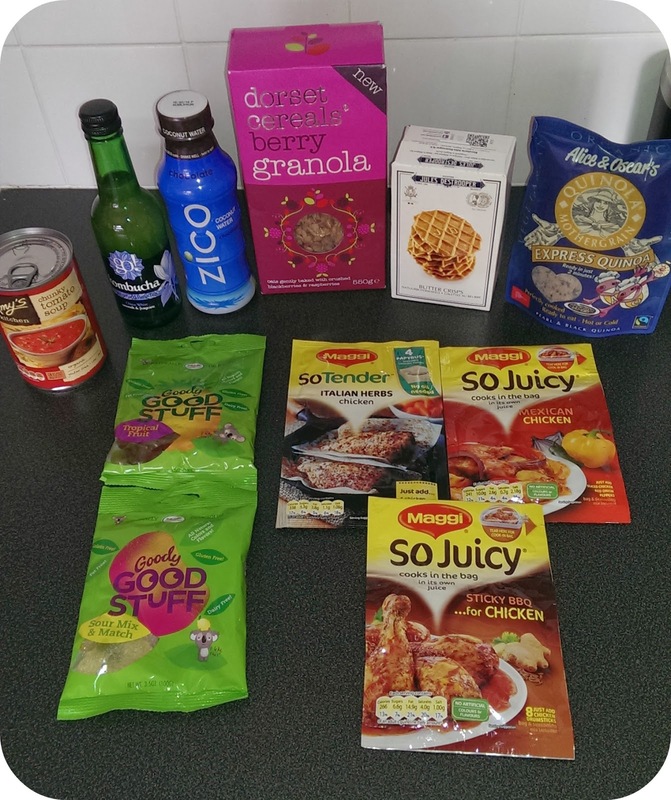 Rather than specialist or organic foods, Degustabox brings you a range of products which you just may not have seen within the supermarket yet. Quite possibly my favourite item within the box, Dorset Cereals contain chunky, crispy clusters of granola along with a generous helping of mixed berries. Within the past 12 months we have had quite a few boxes of cereal from within the Dorset Cereals range and they are all tasty. I've heard quite a lot of good things about quinola, however never actually tried it as of yet. This is a microwaveable sachet which is ready in just two minutes. As a busy parent, I'm often a fan of healthy shortcuts so this is one I can't wait to try. Unlike ice-cream wafers, these large, thin, wafer designed butter crisps were delicious. They are quite dry by nature but are buttery and gently spiced. According to the website, these biscuits follow a 125 year old recipe which has passed through 4 generations of the family. This is the UK's leading raw kombucha tea brand, I have to confess I didn't like the taste of this fermented tea however it may appeal to some. It is filled with pro-biotic enzymes, antioxidents, vitamins and minerals so perfectly good for you. Coconut Water is something I've never tried, but I've heard about it being a really healthy drink. The one which was in the Degustabox is a Zico Chocolate Coconut water, its made from 85% coconut water (from concentrate) and a natural chocolate flavour. I'm yet to try this one, but it does sound interesting. We use Maggie So Juicy packets quite a lot, when we cannot think of a simple meal idea, this is one we often turn too. The meats in which you place within often retain quite a lot of the flavours so when you come to eat them, they are full of flavour - always a good thing. I did get to try the Mexican Chicken and Sticky BBQ which I hadn't tried before. I'm quite lucky that I'm not vegitarian, or have a gluten, dairy, soy or nut allergy so have never had a problem with food shopping, however I remember when shopping for dairy free items for Jack it was difficult. These sweets are suitable for these and also suitable for vegitarian, halal or kosher diets. However, this doesn't stop them from being tasty. I found these sweets very tasty and still chewy like regular sweets. This is the first time I had ever heard of the Amy's Kitchen brand, this soup is made from organic ingredients. I find soup perfect within the winter months when its colder as I feel it really warms me up. Its also gluten free, so perfect for gluten free diets. Included within the Degustabox as a recipe sheet which included two recipe ideas, in which you can use your ingredients to make. I like the sound of the So Tender Italian Herbs with Runner Beans and Carrots, but also looking forward to creating some meal ideas of my own. Readers of My Mummys World have been given the opportunity to try a Degustabox with a discount code, which will give you £3.00 discount when registering. Our code is ZXPCT to enter at the checkout. Disclosure: We were sent a Degustabox for review, all opinions and pictures are my own. Sounds interesting although is it just me that thinks the name of the box is less than appealing? This is such a great idea, I really like the idea of a surprise each month. what a fun idea to try out some new foods that you normally wouldn't choose.